Sorry. It's all I could think of. i am so not clever enough to understand the irony here. lacks interest, no DOF, poor composition. Looks like just a snapshot. I see what you are getting at here, it's just that for me this isn't photography taking a pic of a chart. But anyhow, on the technical side I would either have included those words at the bottom in your photo or left them completely out. Only having half of them there is a little distracting. Whoa! A little too close I think. It blurred your image and added noise. I'd guess that this is an equipment issue. Know the limits of your camera. Even less fancy ones will take great shots if they're utilized right. This shot is inventive and my guess is that you were trying to convey that Iron's symbol has an E in it. Next time I'd try backing off a bit or altering your prop ahead of time to make editing easier. Hope this helps. Good luck. You need a subject with more dimensions. 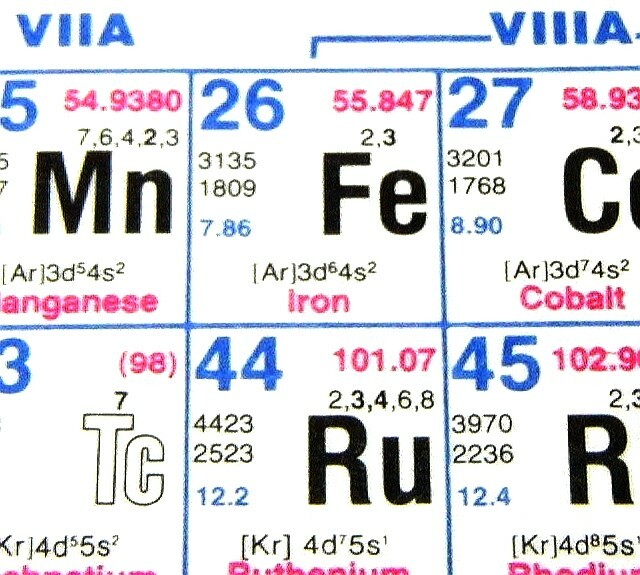 While a periodic table is useful a photograph of one isn't interesting. I like the word play however. Good detail, I like the colors. Cute. but it looks like there wasn't enough resolution, or maybe you just enlarged it too much. I never got Chemestry, so this is way over my head, I think. don't really see any irony =/ is it just me? Message edited by author 2003-10-08 01:31:50. Proudly hosted by Sargasso Networks. Current Server Time: 04/24/2019 09:49:50 AM EDT.